"Moving along to box 1 folder 39 is a promo card for Rev. W.E. 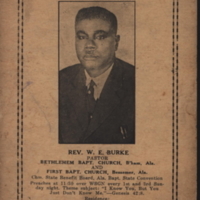 Burke pastor of the Bethlehem Baptist Church in Birmingham and the First Baptist in Bessemer. It announces that he preaches at 11:30 over WSGN every 1st and 3rd Sunday night. Again has a very small phone number; the number is 76225 so we are approximating the 40s, here we gave it the date 1947. For something more exact one could go to the Birmingham radio logs at the Birmingham library microfiche and try to track down when his program was listed at WSGN on the 1st and 3rd Sunday. That card, that promo card, was given to me by somebody who used to work at Ollie’s BBQ place on University Blvd. (became a church, now empty) who I think was his daughter, and I don’t know who that was who donated that card. It may be in some other information. I do remember picking it up at the BBQ place from her." “Promo Card, Rev. 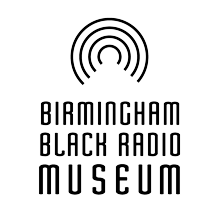 W. E. Burke,” The Birmingham Black Radio Museum, accessed April 21, 2019, http://thebbrm.org/item/150.